Pristine waters, unspoiled nature, white-sand beaches and striking natural wonders — that is what I love in a vacation and it can be found in our own backyard, La Paz. Jacques Cousteau called the Sea of Cortez the “aquarium of the world” and La Paz is its gateway. Located at the southern tip of the Baja Peninsula, a short flight away from Los Angeles (Aeromexico flies direct), a once-in-a-lifetime adventure awaits families. Here are five activities that the La Paz Tourism Board recommends for a memorable family vacation. 1. Espiritu Santo. 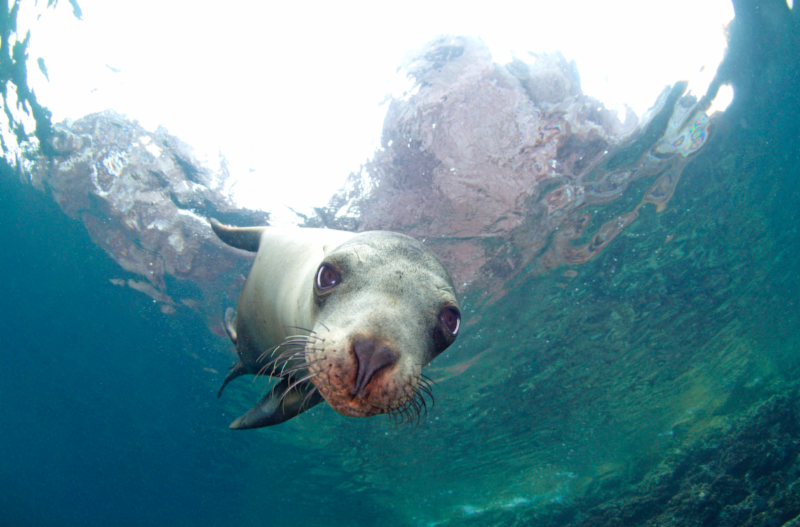 Espiritu Santo is a UNESCO-protected natural area north of the Bay of La Paz and home to one of the largest sea lion colonies in the world. Families can swim with the sea lions at a rocky atoll known as Los Islotes. The experience was called the “best animal encounter of 2014” by Scuba Diving Magazine — and you don’t even need your scuba gear. FunBaja provides daily transportation to the site. 2. Eat Like a Local. As a traveler with a passion for food, Mexico holds a special place in my heart and is my favorite food destination. Mexican food is also exotic enough to be a culinary coup for adults, but not to strange to turn off young palates, making culinary adventures enjoyable for the whole family. The La Paz Tourism Board recommends stopping into El Bismarkcito, (located on Paseo Alvaro Obregon, between Constitucion and Hidalgo) to savor the local flavors of the sea. The family-friendly seafood restaurant offers a variety of fresh, authentic seafood dishes, including what are arguably the best fish tacos in town. Kids don’t despair: There are a variety of kid-friendly, non-fishy dishes, just for you. Afterward, La Fuente (located onAlvaro Obregon and Ocampo) offers homemade ice cream with flavors such as jamaica (hibiscus) cucumber with chile and pitahaya (dragon fruit) for the adventurous as well as your standard strawberry and vanilla. 3. Play Like a Local. Stroll the malecon (boardwalk) for an afternoon to get a feel for the heart of the city. The three-quarter-mile paved cement boardwalk is lined with bronze sculptures and a perfect place to watch the sun set. 4. Beach Day. Uncrowded crystal waters and miles of white-sand beaches are located within minutes of the city. Balandra Beach offers calm, shallow waters perfect for young children and is one of La Paz’s most famous natural sanctuaries. El Telecote Beach is also popular with children for its variety of activities, including Jet Ski, kayak and paddleboard rentals. 5. Nature Tour. Exploring La Paz’s rich cultural history is not enough. An eco-tour is a must. Companies like RED sustainable travel offer turtle conservation expeditions that will enrich educational experiences for families. The kids can play marine biologist for a day monitor sea turtles, interact with researchers and care for the endangered species. It’s hard to imagine that such biodiversity can exist just a short distance from Los Angeles. Families who dream of heading to the Galapagos one day or who desire natural and cultural experiences will delight after a trip to La Paz.